For the second time since I became chaplain at St. Vincent's School I have added a team of student acolytes to our "Wall of Honor." These are students who happily volunteer their time to insure that our daily worship at the school pays as much honor as possible to the King of Kings. 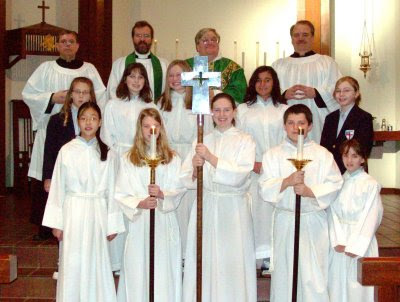 While every student in the middle school must serve on chapel crew at some point in each term, these students serve "above and beyond the call of duty" as readers, crucifers, torchbearers, and acolytes at our daily morning prayer services and monthly Eucharists. The newly-honored "A Team" includes (front row, left to right) Esther C., Allie B., Tory T., Matt J., and Kristin H., as well as (second row) Jordan W., Maren M., Rachel M., Stephanie C., and Bailey J., pictured above after this morning's school Eucharist. Thank you, my brother and sisters. It is a privilege to serve at the Lord's Holy Table with you. I am grateful for your frequent assistance in leading the worship of our SVS community. Fr. Davidson Morse of St. Andrew's in downtown Fort Worth frequently assists us in chapel, as do our lay ministers, Ken Monk and Neil Rogers, who are also pictured above. Thanks very much for your help as well, gentlemen. How many Anglicans are there within ACNA? More than in 12 other Provinces of the Communion! On every Sunday morning, some 81,311 people worship at the 693 congregations of the Anglican Church in North America. These people and parishes are already outside of The Episcopal Church and The Anglican Church in Canada. The large majority are temporarily under the oversight of six separate Anglican provinces. • The Anglican Mission in the Americas (Rwanda) reports an average Sunday attendance of 21,600 in 180 congregations (40 of which are churches in formation called “networks”). • The Convocation of Anglicans in North America (Nigeria) has 69 congregations with an average Sunday attendance of 9,828. • The Reformed Episcopal Church has 150 parishes and an average Sunday attendance of 13,000. • There are 51 parishes under the temporary oversight of Uganda with an average Sunday attendance of 7,000. • There are 55 parishes in The United States under the temporary oversight of the provinces of Kenya and the Southern Cone with an average Sunday attendance of 10,000. • Four entire dioceses separating from The Episcopal Church, with a combined 163 parishes and an average Sunday attendance of 16,483 (The Episcopal Church congregations and members having been excluded from this count) are temporarily dioceses of the province of the Southern Cone. • The Anglican Network in Canada (Southern Cone) is composed of 24 congregations with an average Sunday attendance of 3,400. • One congregation is under the temporary oversight of West Africa. My father took this picture tonight from our backyard in Bedford, Texas. Ruth Gledhill of The Times of London has posted an interview with Bishop Harvey of the Anglican Network in Canada on YouTube. There is no breaking news, but orthodox Anglicans heading towards ACNA might want to become acquainted with this important leader of our new province-in-formation. Bishop Iker has responded to the Communique produced at the Alexandria primates' meeting with his usual clarity and concision. Read it all here. In his letter the bishop makes it clear that ACNA's plans for this summer are still entirely on track. The constitutional convention will still take place here at St. Vincent's Cathedral in June and ACNA will become a fully functioning reality. Thanks be to God! In paragraph 12, the Primates state that “it is imperative that further aggravation and acts which cause offence, misunderstanding or hostility cease.” I sincerely hope this is possible; I am all for a ceasefire and reconciliation. But it appears to me that two things are certain: ACNA will be formed in June to chart a way forward for orthodox Anglicans in North America, and the General Convention of TEC will meet in July to do what it must do. I see no realistic chance of reconciliation between these two bodies on the horizon, but rather a continuation of the “deep differences and disrupted relationships” that have torn the fabric of the Communion at its deepest level. Nonetheless, we place our hope and trust in Jesus Christ alone for what the future might hold for our beloved church – which is His, not ours. My first impression upon reading the Primates' Communiqué from Alexandria was, "There is not much substance here." Upon closer reading, however, my response turned to shock at what our orthodox primates actually had agreed to in the document. I have calmed down a bit since then, and here are my more considered reflections. There are a few things in the Communique that are favorable to orthodox North American Anglicanism. Lambeth 1.10 was affirmed, for example, in paragraph 12 ("the position of the Communion defined by the Lambeth 1998 Resolution 1.10 in its entirety remains"). But there is much to disturb the orthodox Anglican in the U.S. and Canada in this document. 14. The Windsor Continuation Group Report examines in Section H the question of parallel jurisdictions, particularly as raised by the Common Cause Partnership, a coalition of seven different organizations [note 10] which have significantly differing relationships with the Anglican Communion. The Report identifies some of the difficulties in recognising the coalition among the Provinces of the Anglican Communion. Significant concerns were raised in the conversation about the possibility of parallel jurisdictions. There is no consensus among us about how this new entity should be regarded, but we are unanimous in supporting the recommendation in paragraph 101 of the Windsor Continuation Group Report. [Note 11]. Therefore, we request the Archbishop of Canterbury to initiate a professionally mediated conversation which engages all parties at the earliest opportunity. We commit ourselves to support these processes and to participate as appropriate. We earnestly desire reconciliation with these dear sisters and brothers for whom we understand membership of the Anglican Communion is profoundly important. We recognise that these processes cannot be rushed, but neither should they be postponed. There must be an ordered approach to the new proposal within, or part of a natural development of, current rules. It is not for individual groups to claim the terms on which they will relate to the Communion. The leadership of the Communion needs to stand together, and find an approach to which they are all committed. Any scheme developed would rely on an undertaking from the present partners to ACNA that they would not seek to recruit and expand their membership by means of proselytisation. WCG believes that the advent of schemes such as the Communion Partners Fellowship and the Episcopal Visitors scheme instituted by the Presiding Bishop in the United States should be sufficient to provide for the care of those alienated within the Episcopal Church from recent developments. RWF resumes: On the positive side, the Primates have recognized that membership in the Anglican Communion is "profoundly important" for those of us in ACNA, and the Primates urge the ABC that dealing with this matter should not be postponed (though it should not be "rushed" either!). But pretty much everything else in the paragraph is unfortunate news for ACNA. For here the primates, including our orthodox supporters (such as my own primate at present, the admirable ++Gregory Venables), have thrown their collective weight behind yet another talking shop—"a professionally mediated conversation" to be organized by ABC Williams. Personally I find it astonishing that, even as we are now just a few months away from the Constitutional Convention of ACNA and faithful dioceses and parishes all over North America are under fierce attack by TEC and the Anglican Church of Canada, the primates are still acting like "relationship counseling" between Bishops Duncan, Iker, and PB Schori may yet resolve our difficulties!! They clearly have no understanding of how complete the break has already become in North America. Literally hundreds of thousands of orthodox Anglicans in North America are firmly committed to total separation from TEC and we will not look back to the "fleshpots of Egypt." No two week "counseling session" is going to alter our determination to be free from TEC's decades-long, irreversible stampede into error. In fact, we must do all in our power to insure that this titanic waste of time and effort does not actually harm our efforts at unity by sapping their forward momentum, especially if the orthodox primates of the Communion delay granting us their full recognition as a province out of respect for the "processes" outlined in the Communiqué's note 11. But, of course, the primates have given the ABC the "out" he needs to delay even convening such "relationship counseling" ("we recognize that these processes cannot be rushed"). The ABC has dragged his feet on every initiative the primates have proposed in the last five years, and now they have actually told him that he need not "rush." I do not believe this "professionally mediated conversation" will take place for months to come. We must not postpone one minute in forming ACNA while awaiting the outcome of this conversational boondoggle. But Footnote 11 (referred to in paragraph 14) is an even more troubling part of the Communiqué. In footnote 11 the primates have unanimously committed themselves to the idea that, "The aim [of the "professionally mediated conversation"] would be to find a provisional holding arrangement which will enable dialogue to take place and which will be revisited on the conclusion of the Covenant Process, or the achievement of long term reconciliation in the Communion." Furthermore, whatever is worked out in the present "conversation" should be "an ordered approach to the new proposal within, or part of a natural development of, current rules." We can be certain that PB Schori will use this language to try to rule out any new orthodox province in North America right from the start, claiming that "current rules" do not allow for such a thing! TEC is the only Anglican franchise recognized in the U.S. under the present rules, she will say. All we can do is point to the parallel Anglican jurisdictions on continental Europe and hope for the best, apparently. To make matters worse the primates have apparently agreed together that "the partners to ACNA" [does this language mean that ACNA itself is not supposed to come into existence this summer and fall, but the Common Cause Partnership alone is supposed to limp along for months or years to come?] must "undertake" "that they would not seek to recruit and expand their membership by means of proselytisation." Surely they don't mean that we are not to preach the Gospel of Jesus Christ and bring new people into our fellowship by baptizing them in our churches [it would be sheer madness for the orthodox primates to tell us not to do that! ], but I gather they mean we must rebuff any future attempts by any more orthodox Anglican parishes, dioceses, or organizations to join ACNA, or Common Cause, or whatever. Do the primates truly think we could stand by and watch while our fellow orthodox Anglicans that are still trapped within the boundaries of TEC suffer and do nothing to help them? But, of course, it now seems based on footnote 11 that the primates are telling these orthodox brothers and sisters still within TEC that "the advent of schemes such as the Communion Partners Fellowship and the Episcopal Visitors scheme instituted by the Presiding Bishop in the United States should be sufficient to provide for the care of those alienated within the Episcopal Church from recent developments." Do the orthodox primates who signed the Communiqué truly believe that the prospect of having a Communion Partner bishop visit for confirmations rather than one of PB Schori's close associates is enough to keep the remaining orthodox contentedly within TEC as GenCon09 hurtles further away from orthodoxy? Are we really supposed to promise to ignore them if they come to us asking for membership in ACNA? Preposterous. Hard as it is for me to believe, the orthodox primates apparently endorsed point three of footnote 11 as well. In it they have pledged themselves to the idea that "The leadership of the Communion [both ultra-liberal and staunchly orthodox?] needs to stand together, and find an approach to which they are all committed." I understand this to mean that ACNA will not be receiving Archbishop Venables, Orombi, Akinola, and Nzimbi's individual recognition as a province this year after all, despite all appearances to the contrary going into the Alexandria meeting. Instead we are apparently to come hat-in-hand to the ABC for his approval [although he has refused to act in any way multiple times already] and then try to get a two-thirds majority vote in the Anglican Consultative Council next year [where TEC and its allies already have sewn up almost a third of the votes!]. Great. To be honest, all this still boggles my mind. How could our orthodox primates possibly have signed onto the content of paragraph 14 of the Communiqué, along with its disastrous footnote 11? The interview with Archbishops Venables and Orombi that Anglican TV broadcast may give us a clue. In it ++Venables seems to come very close to saying that the Anglican Communion as we have known it is finished. All that remains is for the realization that we have two entirely different and irreconcilable religions co-existing inside the Communion today to take hold. [Apparently he feels this realization set in around the conference table at Alexandria, which gave him great peace.] Once that realization dawns upon everyone we can move along in the formation of an entirely new, orthodox international Anglican structure to replace the old Communion framework. If this is the case, ++Venables seems to be saying, then sweating out the details of exactly what is going on jurisdictionally in North America isn't really all that important right now. Just cobble something together as a temporary measure and we can welcome the new North American province into whatever international grouping emerges from the wreckage of the present Communion in a few years time. For ++Venables our main concern now should be to insure that the separation of liberal and orthodox world-wide is done "graciously." Archbishop Orombi's views do not come across quite so clearly in the interview. Personally I cannot imagine what benefit the large-scale "commission of theologians" he proposes from the liberal and the orthodox expressions of Anglicanism will confer. Perhaps there are still significant numbers of people out there who don't yet understand the fundamental nature of the doctrinal divisions between us (which ++Orombi himself apparently did not properly comprehend until this meeting, when ++Aspinall of Australia explained them to him) and this conference is supposed to make those differences clear beyond any dispute. Frankly such a conference seems little more than a collasal waste of time and money at this late date, but I suppose it would not do too much harm for all involved to have greater clarity on the full nature of our irreconcilable differences. I am truly surprised, however, that ++Orombi still seems in this interview to think that if only the orthodox in North America could have a little time face-to-face with ABC Williams that he will come out in favor of ACNA, as if the ABC has not been kept fully informed over the last five years of North American developments. It is clear beyond doubt at this point that the ABC is not willing to do anything to help the orthodox become free of TEC's clutches. No meeting, even if called as ++Orombi hopes by May, will change his studied indifference toward bringing Anglican North America's troubles to a conclusion. His sole goal is to keep everyone at the table talking as long as he stays in office. A genuine resolution to this crisis is not in the cards, if ABC Williams calls the shots. All that being said, I still hold Archbishops Orombi and Venables in the highest regard as men of God. I do wish, however, that the orthodox primates had not lent their voices to the unanimity of this deeply-flawed Communiqué. It bodes little good for orthodox Anglicanism in North America. I earnestly hope that the leadership of ACNA will not alter our plans one iota because of this Communique's existence. And I hope that the Fellowship of Confessing Anglicans' international leadership will act swiftly to bring Archbishop Venables' vision of a re-structured Anglican future to fruition, if that be God's will. Anglican TV has a "must see" interview with Archbishops Orombi and Venables (my own primate at present) from Alexandria. Click on "primate meeting debriefing" on the side bar. It is forty-four minutes long, but PLEASE watch all the way to the end. There are, btw, some editing problems. There are two lengthy bits (several minutes long) repeated in the middle of the recording, but do please view the whole thing through to the end. This interview helps to put the orthodox primates' endorsement of a remarkably weak Communique in perspective. I will have some in-depth reflections of my own in a another post in a few hours, but for now view the interview and read the Communique. The Ven. Rev. Dr. Edwin Byford, a friend and mentor of mine who presently serves as archdeacon of the Riverina and rector of Coolamon-Ganmain in the diocese of Riverina, New South Wales, has sent me the following comments on the Primates' meeting via e-mail. Fr. Byford is a keen observer of the Anglican scene, and I reproduce these remarks for your consideration with his kind permission. "The initial indications from Egypt are not at all surprising. The word after Lambeth was that most of the liberals — USA, Canada, New Zealand were very anti a covenant but so were the most conservative — Japan, North and South India. Those who most favoured a covenant were those who had a broad church which went from conservative to liberal and had mechanisms for holding together with all their differences. It would most certainly be the case that the greatest opposition in this country to a covenant would come from Sydney because that would mean that the rest of the church would have an intervention mechanism against their moves towards lay presidency. The problem is not just those of us who would want to hold to the traditional formularies verses those who are liberal but that there are some very strange alliances between traditionalists and lunatic liberals who want to protect their peculiar polities. This is far from over and going on some of the reports from Mississippi with regard to the visit by the Presiding Bishop all is not going smoothly for her and the General Convention could be a lot more entertaining than 815 would desire. I suspect that there will be real ghosts in Denver." David Virtue has not always proven to be the most accurate of reporters, and I am hesitant to vest too much authority in his reports. But if this report from VirtueOnLine is accurate, and Archbishop Aspinall is truly reflecting the state of things behind closed doors, the Primates meeting in Alexandria may portend the end of a united Anglican Communion. According to ++Aspinall of Australia, the much-awaited Covenant will have no disciplinary teeth at all. It will, instead, rely entirely on self-policing based upon the "moral authority" of covenant! It will, in other words, be a completely symbolic statement that means absolutely nothing in a place like North America. Once the Covenant is in place it can be disregarded by the likes of TEC and no meaningful attempt to bring about compliance will even be attempted. There will be no more “stick over the head sanctions” in dealing with Anglican provinces that do not toe the line over homosexual practice, said Australian Archbishop Philip Aspinall, spokesman for the 34 assembled Primates of the Anglican Communion. At the first press conference on what 38 archbishops of 55 million Anglicans are engaged in, Aspinall said there was a “pulling back” from language that talked about sanctions, enforcement and teeth as they are inappropriate for the Body of Christ. Instead, a framework for koinonia, relationship and fellowship will prevail, with increasing realism about what a Covenant can and cannot do. Legislation is not the way forward, he said. When questioned by VOL about how discipline will be exercised when things are now going to be based on “koinonia”, “relationships” and “bonds of affection”, rather than Scripture and the creeds, Aspinall replied that if there is a failure of koinonia, then we need to be investing further in communion. He said the provinces need to be committed to covenant, but not committed to a particular covenant. Aspinall said Lambeth pulled back from that kind of (enforcement) language. He said the Province of Australia has a three-fold method where sanctions could be applied. He said the first is adding to the constitution, “but that is unlikely to happen.” Second is to pass a canon through the General Synod, “but that is also unlikely.” Thirdly, pass sanctions through a resolution of General Convention, but it would have no legal force. There is only moral obligation, he said. RWF resumes: With all this talk of a "moral obligation" to koinonia, where have the Primates been for the last five years?!? TEC has no sense of "moral obligation" to the world-wide Anglican Communion at all. And GenCon09 in six months will prove that point beyond dispute when it drops even the pretense of observing the moratoria of Dar es Salaam. I don't really know what hope is left to cling to with respect to the future of the Anglican Communion now. The Covenant will be useless. It sure looks like the Communion either will not survive as a united body, or it may no longer be worth being a part of. If any member Province can do whatever it wants with nothing at all that can be done to discipline it, then TEC's progress down the road to Unitarian Universalism will proceed completely unchecked. Words fail me. Sad news indeed. My dear friend M.B. Hwang has created this wonderful lantern in the form of her parrot, Clio, for a commemoration of Chinese New Year at the parish she is presently serving as an intern, All Souls Anglican in Wheaton, Illinois. Excellent work, ma'am!